Bibleland also known Shoemakers land because cobblers traded from this building. Originally built by the Cordiners in 1677, the frontage to this tenement has undergone total rennovation. 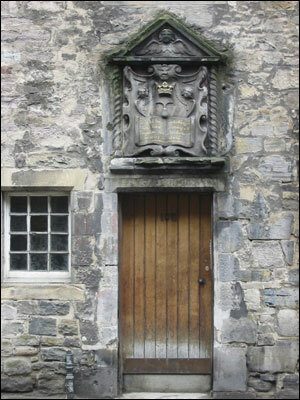 The exception to this is the original features found above the entrance - a cartouche bearing a grotesque head and shoemakers knife (the family emblem). The scrolled book below bears an inscription inspired from Psalm 133, the reason for the name of this location..